Hello and welcome to my website! Take a look around. Get to know me, hear some samples, see when and where I'm playing, and find out how to contact me. I'm a singer and guitarist based in the Greater Richmond area. 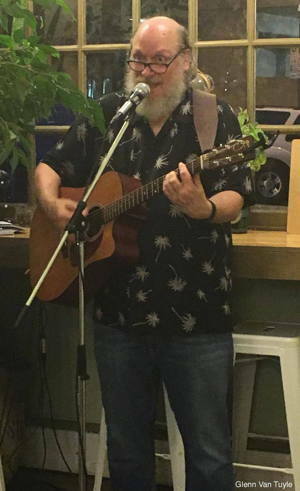 I play mostly acoustic covers of classic rock tunes, with a smattering of other genres and a few originals. I try to adapt my performances to the occasion. In bars and at parties, I play mostly up-tempo, energetic rockers; for dinner-hour entertainment I can play mellow and leave space for conversation; and when the situation allows, I like to mix it up. I usually play from a set list, but I'm always ready to take requests. I also play with fastrac, a classic rock cover band, featuring Ray Wells (drums), Marc Morison (keyboards), Paul Burnette (bass), and Sam Goldberg (lead guitar). We play an eclectic mix of rock and blues; we like to get people on their feet and dancing. I hope you'll come out and have a listen. If you're a music lover, I think you'll enjoy it!